Porsche celebrates a historic moment at the Geneva Motor Show, which takes place from 7 to 17 March 2019: precisely 70 years ago, the young brand introduced itself to an international public audience for the first time. That spectacular première would be followed by many more over the decades – in each case with the sportiest models of the era, in a Porsche tradition that has been upheld right up to today. To celebrate the 70th anniversary of its debut in Geneva, the sports car manufacturer will present the eighth generation of the iconic 911, in Cabriolet(1) form; at the same time, the 718 Cayman T(2) and 718 Boxster T(2) will also celebrate their world première. 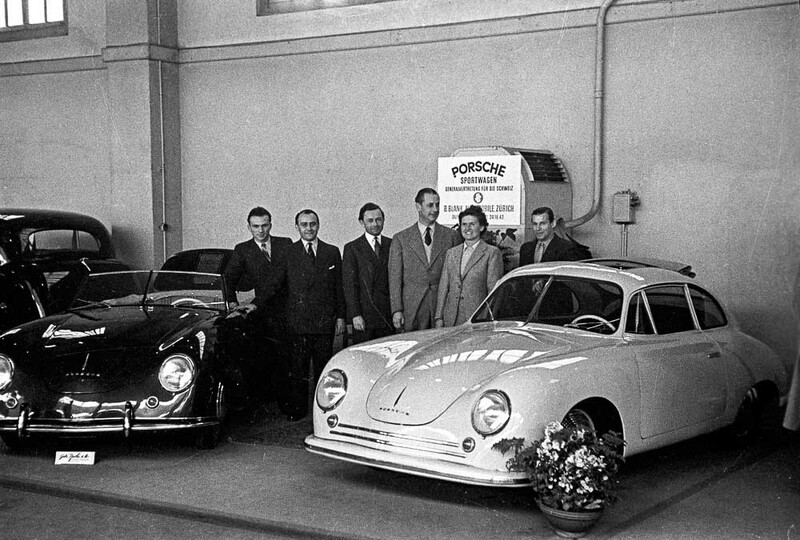 70 years ago, on 17 March 1949, it was a 356 Coupé and 356 Cabriolet from the production facility in Gmünd (Austria) that Porsche presented at its small stand in the main hall. The response was fantastic, with both sports cars enthusiastically received. The successful showing in Switzerland is considered to be the foundation for the later breakthrough of the first series products from Zuffenhausen: by 1965, a total of around 78,000 units of the 356 had been built. The Porsche 904 Carrera GTS celebrated its première in Geneva 55 years ago. The Geneva Motor Show has a reputation for being the largest motor show in the world; a claim forged during the 1960s in particular. Every year, Porsche joins many other manufacturers there to present its strongest developments. The Porsche 904 Carrera GTS celebrated its première in Geneva 55 years ago, when the mid-engined sports car designed by Ferdinand Alexander Porsche was the subject of much admiration – in fact, the 904 Carrera GTS is still considered one of the most beautiful Porsche sports cars of all time. This year, Porsche celebrates “50 Years of the 917”. The Porsche 917 also had its public debut at the Geneva Motor Show, in 1969, when the Press Department announced the strongest racing car of its time as “one of the most serious competitors in traditional long-distance racing”. Exactly 50 years on, the 917 with chassis number 001 goes on display in the Porsche Museum, restored to its original condition as in 1969. The sports car manufacturer also selected the Swiss trade fair floor for the world première of the first 911 GT3. The 911 GT3 from the 996 series, in understated Arctic Silver with “fried egg” headlights, met the world’s press here in 1999. 20 years on, the GT3 denomination still signifies a sports car legend. In 2014, Porsche celebrated its return to the big motorsport stage and with it the world première of the Porsche 919 Hybrid for the top LMP1 category of the FIA World Endurance Championship (WEC). In 2014, Porsche celebrated its return to the big motorsport stage and with it the world première – in Geneva of course – of the Porsche 919 Hybrid for the top LMP1 category of the FIA World Endurance Championship (WEC). Its most famous milestone is the 24-hour race at Le Mans. The WEC regulations – which had only recently been created at that time – require an innovative hybrid drive. The 919 Hybrid with system output of around 1,000 PS would also function as a research space for the technology of future series-production vehicles. From 2015 to 2017 inclusive, the Porsche LMP team achieved three Le Mans overall victories in a row, three world championship titles in the manufacturers’ standings and three world championship titles for the drivers of the Porsche 919 Hybrid. The LMP1 prototype was flanked on the Geneva stage by the Porsche 911 RSR, offering around 470 PS in the sharpest racing sport version of the sports car icon. The two racing cars – the 919 Hybrid and 911 RSR – started in various classes of the WEC, making 2014 the year of the most extensive motorsport programme in Porsche company history. One year ago, in 2018, Porsche introduced two innovations that represent the mainstays of the company’s product strategy: the 911 GT3 RS(3) with a motorsport chassis and a 383 kW (520 PS) 4-litre high-revving aspirated engine, and the concept study for a fully electric Cross Utility Vehicle (CUV). Highlights of the study include its emotional design with striking off-road elements, as well as the innovative display and control concept with a touchscreen and eye-tracking control. Featuring a deep bonnet between heavily curved fenders, the front of the Mission E Cross Turismo has a clear visual link to the Porsche 911. One year ago, in 2018, Porsche introduced the concept study for a fully electric Cross Utility Vehicle (CUV): the Mission E Cross Turismo. This concept vehicle, 4.95 m in length, offers more than 600 PS and all-wheel drive. The ready-to-drive Mission E Cross Turismo is connected with the Mission E study that was demonstrated at the 2015 International Motor Show Germany (IAA). In autumn 2018, the Porsche AG Supervisory Board decided to put the Taycan Cross Turismo into series production at the Zuffenhausen site.